Over the next year, I am introducing an occasional feature I call “Throwback Thursday.” This is where I find a blog post from the past–raiding either my own vault or someone else’s–and throw it back out into the digital world. This might be an idea or book that is now relevant again, or a concept I’d like to think about more, or even “an oldie but a goodie” that I think needs a bit of spin time. This post from July 2013 and really is just a fun little tidbit. It is nostalgic for me in a couple of ways. First, this was my first post to be “Freshly Pressed” on WordPress. As a result, it had hundreds of shares, likes, and comments by other bloggers, creating digital connections I still have today. Second, this five-year-old post about my own work as a “speculative cosmographer” reminds me of the mouldering manuscripts in my digital wardrobes. I hope over the next year to be able to print more of these business cards. If I were to print a business card for what I do as a fantasy writer, in the section called “title” I would put, “Speculative Cosmographer.” Fancy title, eh? Well, broken down, it really just means fictional world-builder. When I write, as all fantasy writers do, I create a world that is consistent within itself. These “Other Worlds” may have their own languages, beliefs, sciences, social structures, laws, and arts. When the author does this well, as in J.R.R. Tolkien‘s Middle-earth, C.S. Lewis‘ Narnia, or Ursula Le Guin‘s Earthsea, the world must rhyme with itself, if you will. It cannot have jarring inconsistencies or tears in the social or scientific fabric that betray the authenticity of that world. The boundary between that world and our own is clear. Middle-earth has some connection to our world today, but you won’t find it accidentally by taking a wrong turn on Crescent Ave. There are some threshold worlds that are connected with our own, but separate in key ways. We see this in urban faërie tales, like Holly Black’s work–most accessible are The Spiderwick Chronicles and Tithe–but also in J.K. Rowling’s Hogwartsian world as she layers England with unseen magic, or Madeleine L’Engle‘s Time Quintet, which plays with concepts of space and time focused around a small New England town. These are fictional worlds that layer upon our own world. But many of our greatest fictional universes are places set apart from Here-Now, and so will typically have a unique geography. And with a unique geography comes unique maps, and I love maps! I do like real maps: pulling down the over-sized Atlas of the World from its shelf and looking up Burundi on a carpeted floor; carefully refolding a road map of Maine; pouring over the complex web of lines that make up a Tokyo highway map. I like maps. But I adore fantasy maps. Half of my time reading Tolkien is spent running my finger along the road from the Shire to Mordor on an onion paper map of Middle-earth I bought at a poster fair on campus. We laminated our coloured map for Narnia for my son’s room as we went through the seven chronicles, and my copy of Paulo Coelho’s The Alchemist was purchased precisely because the version next to it lacked a map. Maps make fantasy reading so much more enjoyable. 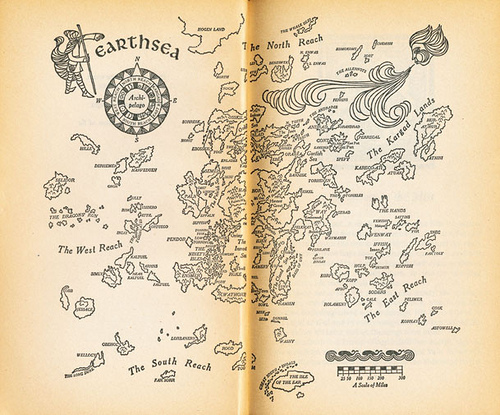 After all, what would Discworld be without flyleaf cartography? How would we know where the Woozle wasn’t if we didn’t have a map of Pooh’s Hundred Acre Wood? I agree completely. 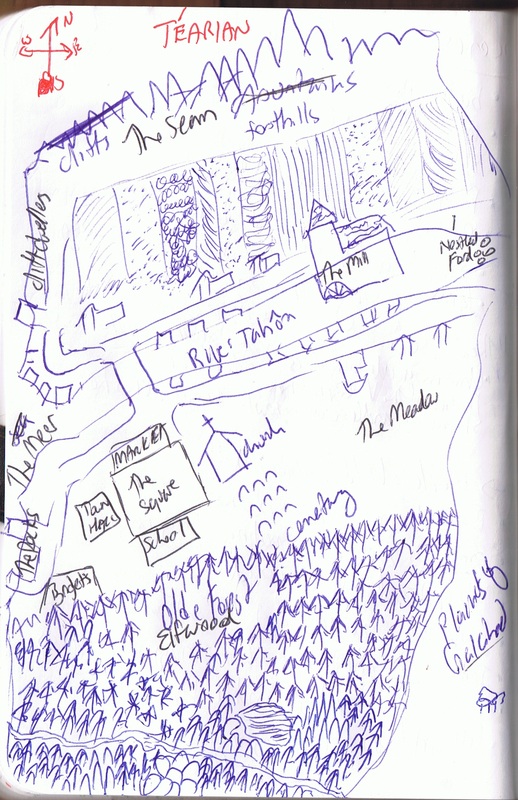 This is why I began a recent fantasy book with a map–a badly drawn one, but a map nonetheless. The valley in The Curse of Téarian is essential to the story as each of its natural borders–woods, sea, mountain, and plain–individually create a different tension in the storyline. The story is authentic to the geography, or at least I hope it is. In this sense, Mara is quite right. 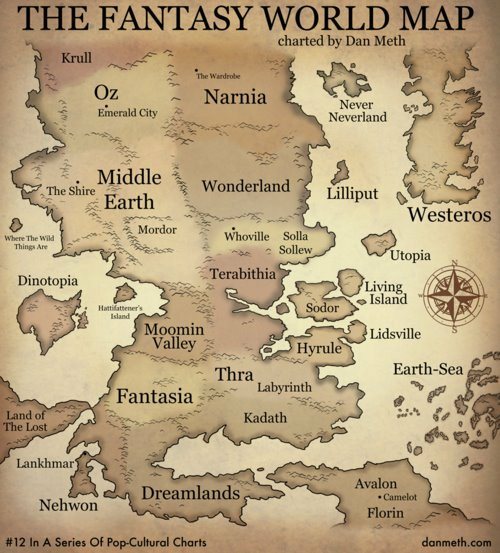 Also included in Mara’s blog is Dan Meth‘s Fantasy World Map. It is, of course, just a fun project–a poster that geeks like me can order from his site. But the map itself shows the tactile nature of world-building. The lands of imagination can be charted, measured, taken from the multidimensional realities of an author’s complex brain and stretched into two-dimensional view. The Land where Oz is north of Middle-earth is the world-builder’s sketchpad, the vocation of a speculative cosmographer. As someone who studies how people build fantasy worlds, I am in that sense a “Speculative Cosmologist.” That, of course, just a fancy way of saying I love how these worlds come together in language, social structure, physics, and geography. But, besides the great fun of mapping out these worlds, the title sure looks good on a business card. This entry was posted in Creative Writing, Fictional Worlds and tagged C.S. Lewis, children's literature, fantasy, Fictional Universes, Harry Potter, Holly Black, imagination, J.K. Rowling, J.R.R. Tolkien, literature, madeleine l engle, Madeleine L'Engle, maps, Middle Earth, Narnia, The Hobbit, The Spiderwick Chronicles, Winnie the Pooh. Bookmark the permalink. Fantastic. I love maps too. I have grudgingly adapted to GPS but I still prefer getting a sense of the big picture from a map before I submit to the immediate turn-by-turn directions that the GPS gives. Otherwise I just feel lost. I have not turned to GPS just yet, not because I don’t like it but because I simply lack the technological capability. But I do love Google Maps. And before that I think I use Yahoo Maps when I lived in Japan, although they were a lot harder to read. Ah, well, … I hope you don’t get lost! Of course, some of the old stories can’t be mapped in the same way, right? Think of all the woodland fairy stories. Aren’t they just hundreds of people bumping into each other as if it is a shopping mall, yet set in the millions of acres that is Britain or Western Europe. Right? Busiest deserted forests I’ve ever seen. What about TWHF? A nice Greekland map of that would be cool. Is there a super cool medieval map blog somewhere? That’s my impression – the geography of chivalric romance has real places, and vivid places which I don’t usually know if they’re real or not or what the distances and directions involved are, either (but maybe I’m just not paying enough attention a lot of the time…). Looking for Spenser maps (with no success), I encountered a literature of Spenserian references to details of Irish geography – apparently, vivid attention to places not themselves in the story. I’d need to reread TWHF carefully – it’s so vivid, but can we place it finely? Meanwhile, I’m making the acquaintance of Sid Meier’s Civilization V and VI watching real-time and recorded live-streaming play, and ran into some nice attention by Roger Pearce to fine Ruritanian travel posters by mbhdesign at Deviant Art, but am finding it odd I cannot easily find any long list(s) of ‘Ruritanian-style novels’ online (places of vivid geography, but I’m not sure how often authorially-approved or -drawn maps). Awesome link. The folio society does beautiful work. Here be dragons, after all. Thinking about (how ignorant I am of) antique maps, I also got wondering about maps and descriptions of visions – such as the Dream of Scipio – Williams has some topographical visions in his novels and poetry – how characteristically ancient is that, or not? To me maps are the heart of fantasy literature: they offer a promise of the unknown, laid out on paper in just enough detail to fire the imagination. 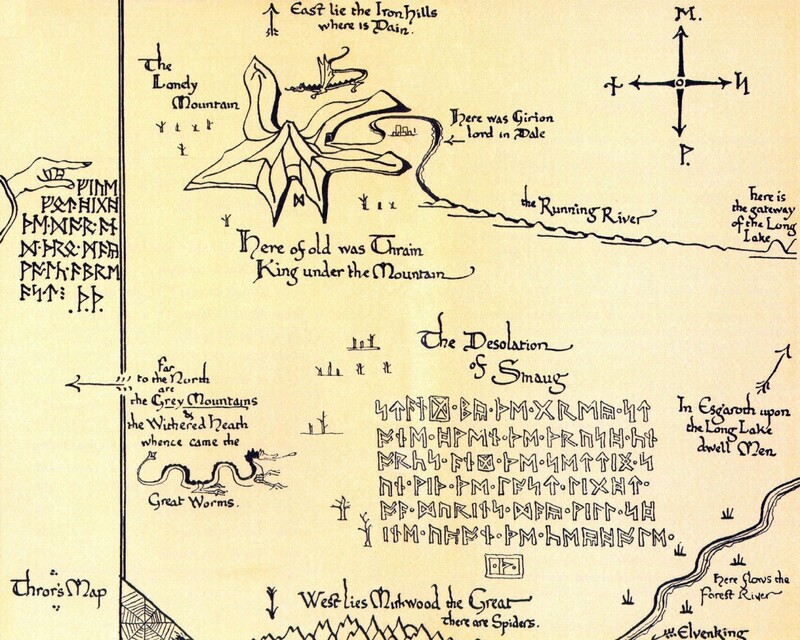 I was introduced to Tolkien through Pauline Baynes’ poster map of Middle Earth. 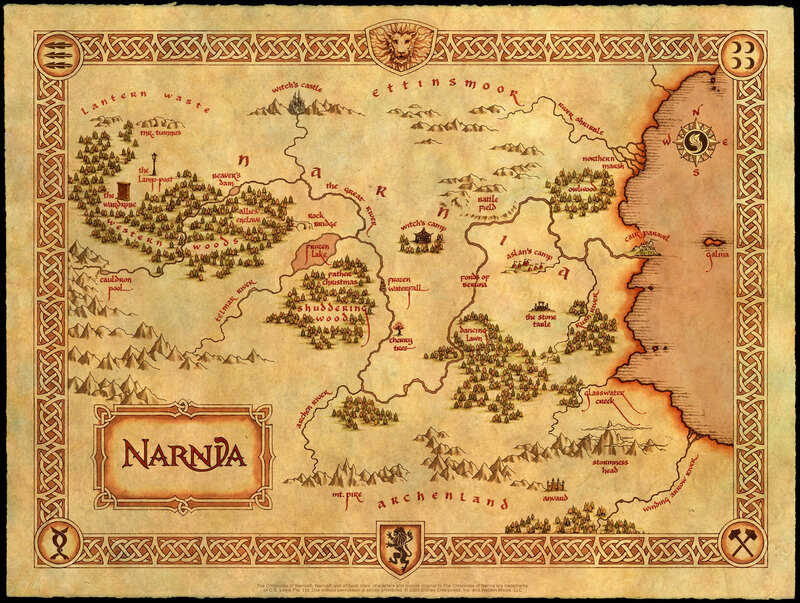 As a kid I also had the Baynes map of Narnia actually glued to the wall above my bed by my parents – later joined by that other map she did of The Hobbit and a small version of her LOTR poster. And, of course, when writing such things maps are so essential! Yes, I’m very much along the same road. I don’t know if “heart” is it for me, but fantasy maps for me are not just enhancement but an integrated joy. Thanks for commenting. I’ve been watching your blog and get your newsletter but time has prevented me from commenting much. David, you probably didn’t mean it that way, but surely “the many strange creatures ….. especially round the edge of the world” were not “marginal (insignificant, small, low, minor, slight ..) features” to medieval men! Just think of how they are still crowding medieval cathedrals and manuscripts. They were very much part of life, enriching and haunting it: even if it was good that the haunting, superstition part was cleared up through centuries of scientific thinking, soo much richness was lost in the process. So great that a.o. the Inklings brought them back into our lives! And also in our natural world there are such a lot of incredibly wonderful, strange and weird creatures; maybe there will be actual unicorns on the New Earth! Myths becoming reality? Nope, I meant it literally! I’m not sure I’ve ever encountered the ‘classical’ mediaeval vocabulary for things like manuscript ‘margins’, ‘illuminations’, and so on. A book (with lots of manuscript illustrations) I read before anything by any inklings (except the quotations from Charles Williams in Dorothy Sayers’ Inferno translation notes) – and am often looking things up in year round – is T.H. White’s wonderful translation, The Bestiary: a Book of Beasts (1954). It has among its many fascinating footnotes one including an experiment in grafting the horn buds of a calf together and transplanting them to his forehead: he ended up ‘displaying exactly the great strength and gentle nature of the legendary unicorn’! Literal? As in scientific? That seems incompatible with the ‘Discarded’ medieval way of thinking, which was só different from ours after the scientific revolution of the past ages.